Lots of good family action going on today. My youngest nephew is running around the house in a full on Jets football uniform, with a real looking helmet and everything, my oldest nephew now has a spy kit which includes a remote control car that is driven through a monitor on his glasses so he can be in another room while driving it somewhere else, pretty neat! 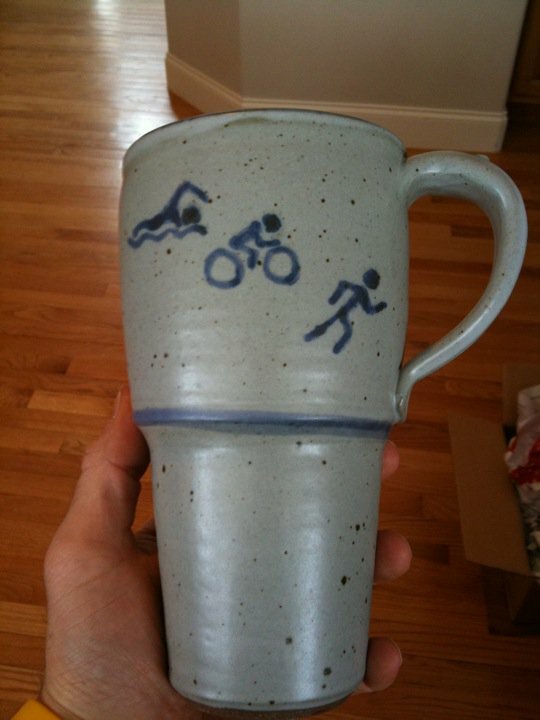 My parents even got me a homemade coffee mug from a local potter that has the artwork of the swim bike and run figures. Very cool, unique and very large!! Pictures to come later but for now its time to eat some good food, rest and read, then maybe go out for a little recovery run tonight. Fireside Chats with Turbeau – Ask me anything! DO IT! post a picture of the mug! thanks for the treadmill company the other day and mostly, thanks for the buzz lighteay detective work.